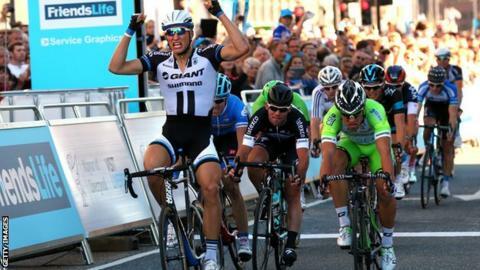 Germany's Marcel Kittel won a thrilling sprint finish in Liverpool in the opening stage of the Tour of Britain. Italy's Nicola Ruffoni was second, ahead of Britain's Mark Cavendish, who contested the sprint despite crashing into a car early in the stage. Cavendish, who hit a car while trying to avoid another car that braked suddenly, said: "I hit it with my left leg and I was down on the road." He added: "I felt immediately a lot of pain on my quadriceps. "At that point I wasn't planning to sprint. But after a couple of laps we decided to just try anyway, but sprint seated because I was in pain. "I still got third, but it's a shame because I really wanted to try and win in front of the British public. I really hope that the luck turns in the next days." Giant-Shimano rider Kittel, 26, said: "It is good to win the first stage and to see the reaction from the crowd." It had been expected to be a showdown between Cavendish (Omega Pharma-Quick Step) - who has won 25 Tour de France stages - and sprint rival Kittel and the fans were not disappointed with the pair lunging for the line. In the end Cavendish, 29, who said last week that he was not in peak condition as he continues to recover from shoulder surgery after crashing out of the Tour de France, did not quite have enough to get past Kittel. Kittel clearly enjoys racing in Britain - he won two of the three Tour de France Grand Depart stages that finished in Yorkshire and London, on his way to winning four in the race. Monday's second stage is a 200.8km race from Knowsley to Llandudno and the Tour then heads south through Wales and visits the south and west of England before ending with two stages in London on 14 September.